With Irene Dunne, Robert Montgomery, Preston Foster, and Eugene Pallette. This sublime film exemplifies La Cavas gift for creating comedies that contain a profound depth of feeling. Starting with a cruel joke, a couple of callow men make a bet that one of them can seduce the woman sharing their train compartment, the film charts the relationship that develops between Irene Dunne, a small-town girl in the big city, and Robert Montgomery, the brother of the man who has heartlessly seduced and abandoned her. Their love affair is all the more affecting for taking place against a backdrop of heartbreak and alcoholism, all conveyed under the guise of comedy. 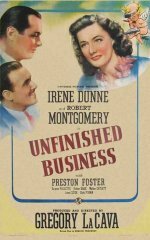 UNFINISHED BUSINESS is truly one of the most remarkable Hollywood films of the 1940s.